Savegame download: note that this requires Simutrans Experimental. Time to share a new project that I've been slowly working on over the past 6-8 months. This map aims to reimagine the rail network of North America - specifically all of the USA and Canada east of Texas and the Midwest. It's a 6000x5000 map with a scale of around 550 metres per tile. It's still very much in its early stages, as you can see from the progress map below. The idea is to imagine what the North American railway network might be like if the attitude to and extent of passenger rail networks was more similar to Europe. So there will be lots of rail lines that don't exist in reality (at least any more). Examples so far include lines to Allentown PA and Salisbury MD. Another diversion from reality is the addition of high-speed rail. I'm going to add a high-speed network on core routes between major cities, like you might expect to find in parts of Europe and Asia. The max speed on the fastest lines will be 300kph (186mph) which is in line with the fastest high-speed lines in Germany. The only high-speed line so far is between Washington DC, New York, and Boston. It takes 1h13m to get from Washington to Philadelphia, 56 mins from Philadelphia to New York City, and 1h38m from NYC to Boston. It runs once every 20 minutes. Its approximate route is on this map. This is a dedicated high-speed route for the entire length - that won't be the case for all HS services. Future high-speed routes will include NYC-Toronto via Albany and Buffalo, and Washington DC to Detroit via Pittsburgh, though I doubt many will have the same high-frequency timetable as the North-East corridor. The base pakset is the same as for the Great Britain map, but I've added some USA-friendly buildings adapted from Pak128. There are only two types of train in service so far: first, one based on the Class 350 which runs a mixture of suburban and express services on conventional lines (max 100mph). My high-speed train is essentially an adjusted Pendolino which can run up to 300kph. Everything so far is electrified, but some more minor diesel routes will appear at some point. 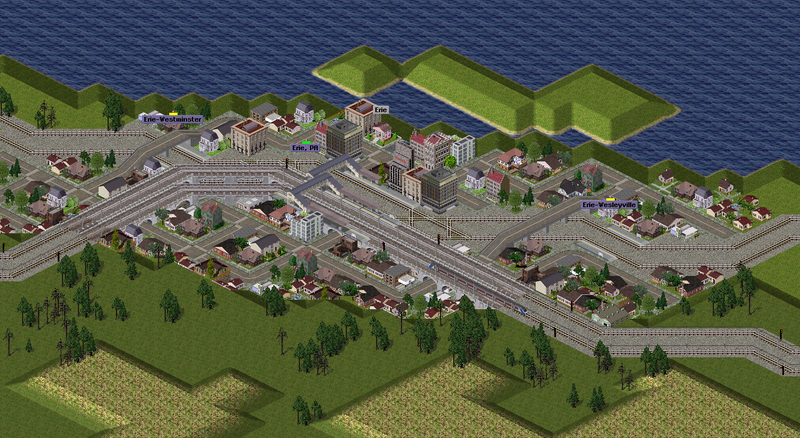 Because of the 550 metre-per-tile scale, it's not possible to simulate much detail in major cities. So for instance there's only a limited suburban rail network in and around NYC and Boston compared to what you'd expect to be able to run in a city that size. This simplification is ok, because the intercity services are the main focus of this map covering a very large portion of the continent. Boston (right) and Providence (left), with the surrounding area. 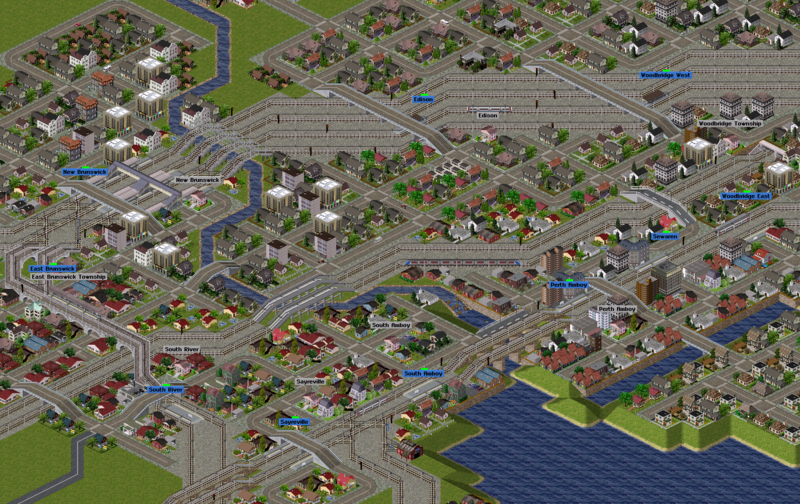 Many of these rail lines don't yet have any services. Much more to follow - but do note that my Simutrans time is more limited these days, so substantial updates might not be very frequent! 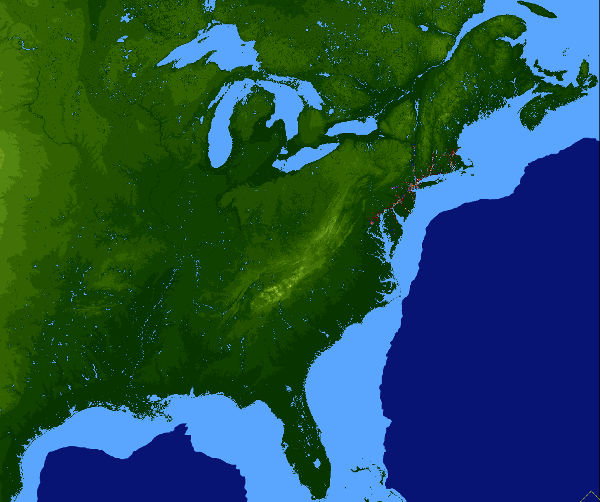 Time to share some more work from the North America map. I've built lines up to Toronto, Buffalo and Rochester, and filled in plenty of gaps elsewhere. You can download the updated save game and pak folder here. The above picture shows Bridgeport (Connecticut), where the Northeast Corridor high-speed line (top) branches onto the conventional line (bottom). The fastest trains go non-stop from NYC to Providence and don't use this junction. Two trains per hour branch off from the high-speed line here and run semi-fast to Boston via New Haven, Springfield, Hartford and Worcester. The high-speed train from New Haven to NYC takes around 45 minutes. Albany in upstate New York, an important junction between the conventional and high-speed lines. The hourly high-speed service from NYC to Toronto stops here. There are a number of branch lines (e.g. to Saratoga Springs), and also a high-speed link to Boston. 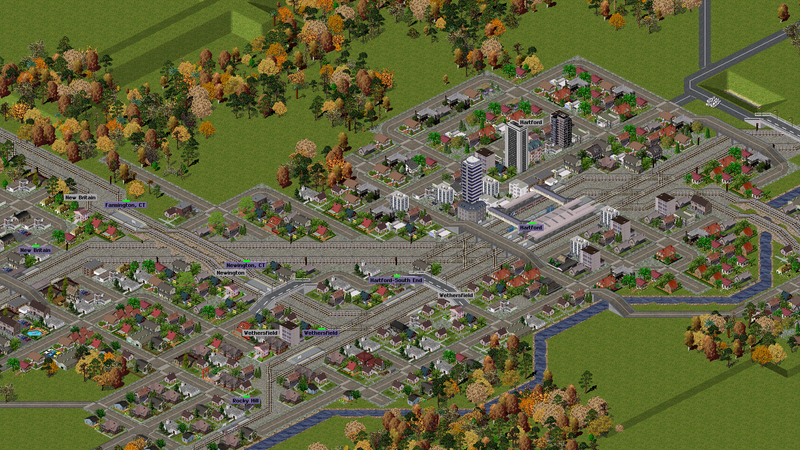 Eventually this will run onwards to somewhere like Detroit, but that's not built yet. 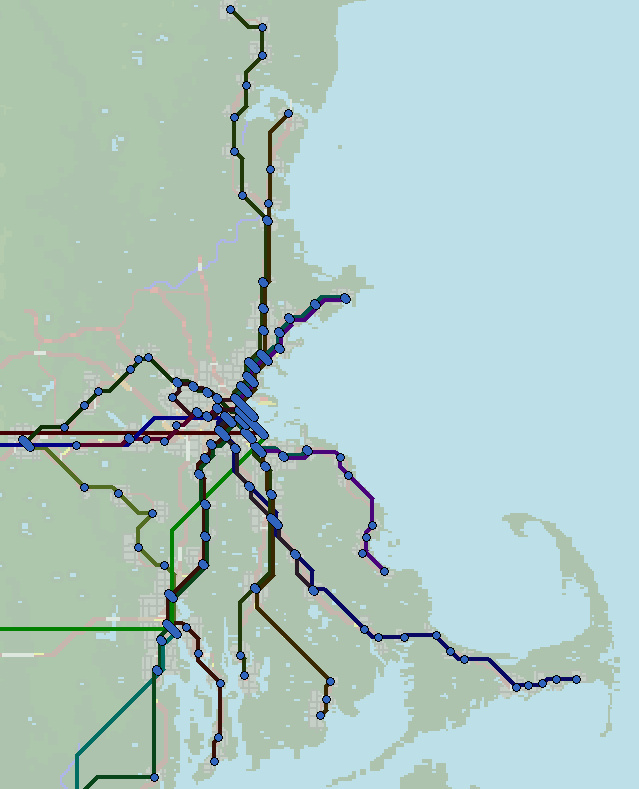 Suburban rail network map around Boston, Massachusetts. This has developed quite a lot since I last posted but is still incomplete. what pakset is used for this game? 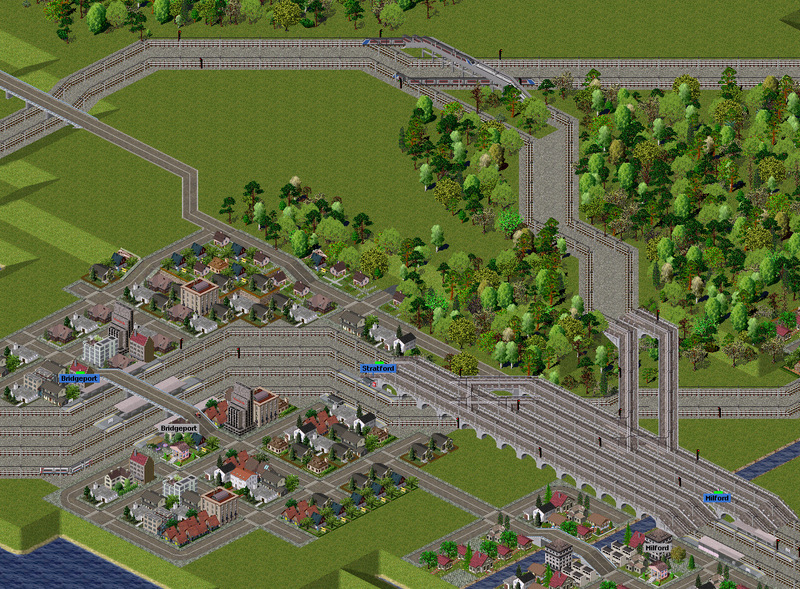 I like those diagonal double tracks. It's a heavily adapted version of pak64. It includes some scaled-down pak128 graphics as they're quite North American-looking. Thought I would update this one since it's been over a year (time flies). I haven't spent mountains of time on it since then, but enough to warrant an update! I've added local and regional services in the Baltimore, Philadelphia and Long Island areas. I've also spent some time making parts of the map look more pretty. Next up will be extending the High Speed network to Cleveland and Detroit. This will help distribute the passenger load a bit since it will be accessed from two different directions (both Washington - Pittsburgh - Cleveland - Detroit and Boston - Buffalo - Cleveland - Detroit). This shot shows Philadeplhia (top left) with a large part of New Jersey, including the Atlantic City line, Trenton, and Toms River. The highspeed line bypasses Trenton and goes straight from Philadelphia to Newark. This shows the lines heading west from Wilmington, Delaware. The line through Elsmere carries an hourly service from Philadelphia to Baltimore. The line through New Castle carries two services from Philadelphia to the Delaware peninsula - one that terminates at Dover, and one that continues to Salisbury. Local services from Philadelphia and beyond also terminate at Wilmington. The highspeed line bypasses Wilmington, so for destinations further afield passengers will change at Baltimore or Philadelphia. This will only work properly with Simutrans Experimental. I've spent a bit of time expanding this map and adding new services. This map imagines what the USA's rail network might look like if they'd invested in high-speed rail (and even conventional rail!) to the extent that some European countries have. I'm building a bunch of big cities and their high-speed routes, and then adding suburban and conventional express routes later. Washington D.C. and Toronto will be the next to get some closer attention as their surrounding areas are pretty sparse so far. Here's the west of Lake Erie, showing Toledo (left), Detroit (top), and Cleveland (bottom). You can see that only the core cities are built and everything else is a work in progress. And if you want to have a look around yourself, here's the save game and pak folder. You'll need the legacy Simutrans Experimental exe to run this. After the HighSpeedRail line from New York to Boston opened, demand patterns for local and regional services changed substantially. A complete re-think of these services was required. Despite an intensive PR campaign stating that "all train times are changing", some passengers expressed dismay when their commutes changed on the first day of the new timetable. Click here for a full-size version. Click here for a PDF version. Three trains per hour run from New York City to Boston South via the HighSpeedRail line. These all originate at Washington, D.C.
Two trains per hour travel on the HighSpeedRail line from New York before rejoining the conventional line at New Haven. Both trains serve Hartford and Springfield, and one continues to Worcester and Boston Central. These provide central Connecticut with fast services to both New York and Boston. To pick up local and regional traffic, a loco-hauled semi-fast train runs from New York to Boston via the conventional line. 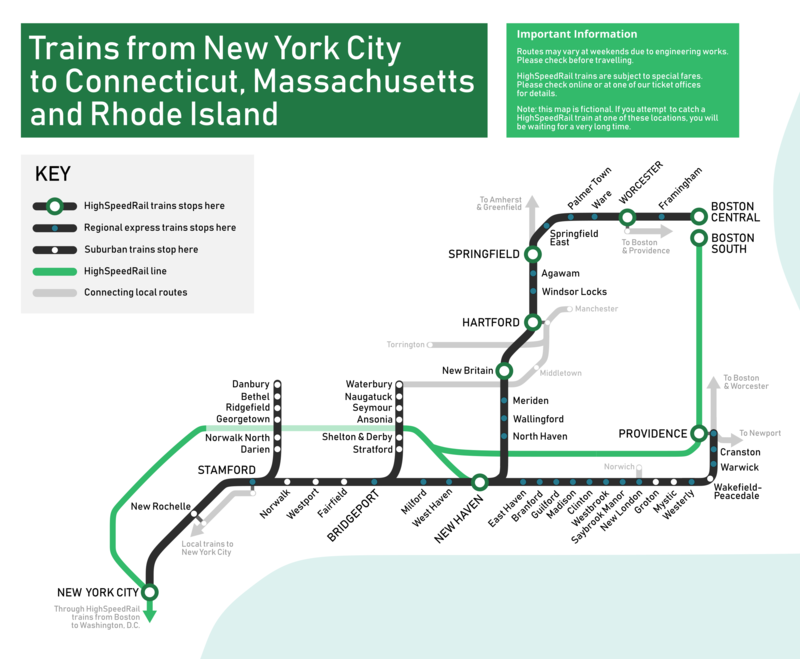 As well as serving all local stations between Bridgeport and Worcester, this provides connectivity from Stamford or Bridgeport to Hartford, Springfield or Worcester. Similarly, a semi-fast runs from New York to Providence, stopping at all local stations between New Haven and New London. 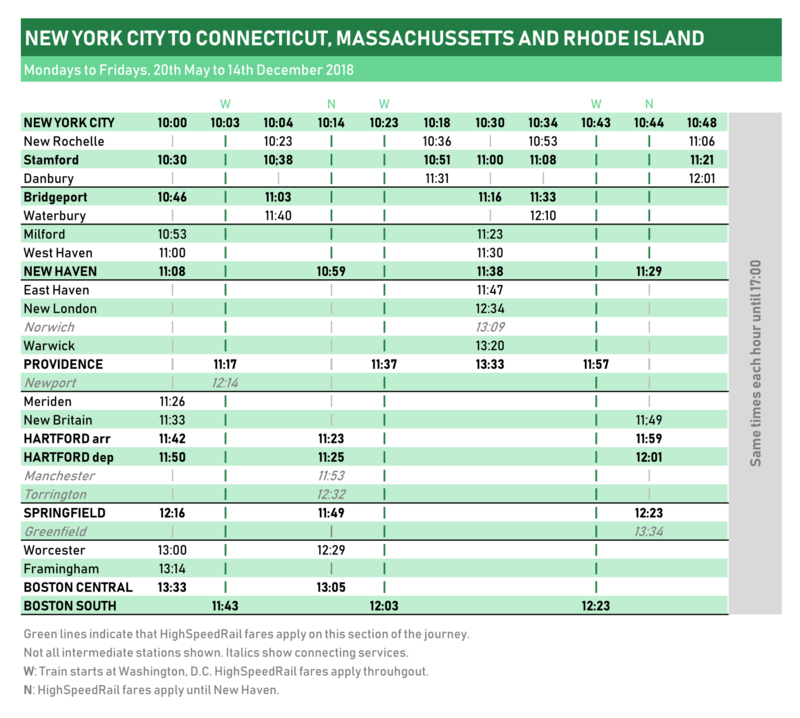 A previous service which ran fast from New Haven to Providence has been axed for lack of demand. Danbury and Waterbury receive a half-hourly suburban service. Hartford is a mini-hub for local services to Torrington, Manchester, and Middletown. Connections to local services are also available at Providence, Springfield, and New London. 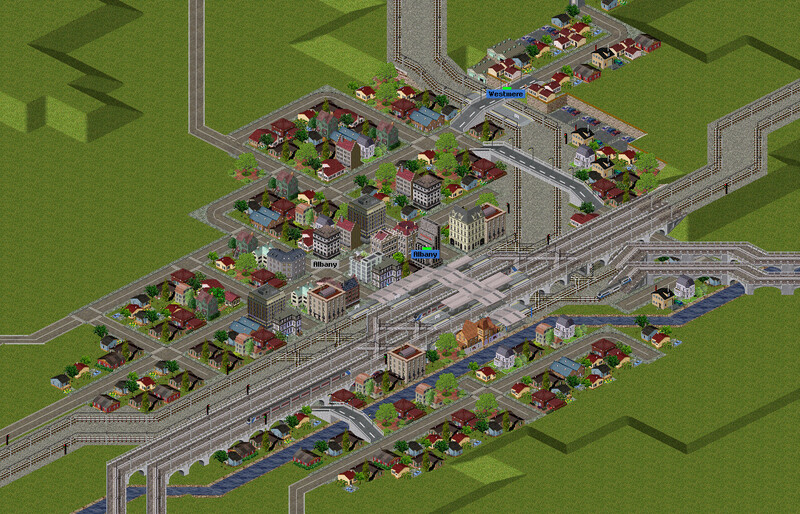 The above screenshot shows several trains passing at Hartford. A fast train from Boston to New York waits in the western-most platform. Next is the semi-fast from New York to Boston. In the bay platform, a local train to Bristol and Torrington waits for connecting passengers. Thanks! Btw, since I saw your timetable I tried to create one for my games, is that really game time or the time interval plus fictional departing hours? The timetable in the post above? It's real game time. Experimental/Extended allows you to simulate this, which is neat.